Your brother is the host of Ghost Riders – a popular ghost hunting TV show, but one night you receive a strange package that forewarns his death! You’ll need your special astral glasses to help you view the past and interact with the astral plane, but first you’ll have to find them! Travel to the haunted mansion of a serial killer and unwrap this unsolved ghost story, before you and your brother become the next chapter of it in this haunting hidden-object puzzle adventure game! 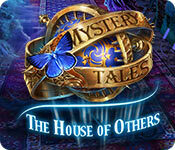 Mystery Tales: The House of Others is rated 4.0 out of 5 by 7. Rated 5 out of 5 by lillyrush from Loved this! There wasn't anything that I didn't love about this game, The storyline, the graphics, the voices, but the music was amazing! I loved the drums that played in it, I normally play games once and I don't know why but this is one I'll be playing again. Rated 5 out of 5 by bessiegirl from restored my faith in adventure games I had stopped playing adventure games, or whatever this game is classified as since they had become tiresome and repetitive. So glad I gave this game one last chance. Very smooth game with interesting HOS and Puzzles (some easy, some more challenging). Story line is same-o, same-o but that didn't interfere with the game play. Objects were often used in the same place they were picked up so your inventory didn't get overwhelmed. Transporter map was very good and made the game play even better. I like the maps that actually show where there is active play so there is no guessing. Graphics could get a bit dark, voice overs were pleasant. Quite a few narratives, but you could skip them and not lose any important game play....that was the major drawback to the game for me. I always turn off the music and play with custom settings which allow a reduction in skip time and hint refresh...always a nice option. I really dislike the constant "tasks" that pop up. I really don't care about those and wonder why that has to be part of the game. I turn that off in options, but they still seem to pop up. I find them totally useless. Would recommend this game. Rated 5 out of 5 by kerith90angel from Based on completed main game (and CE bonus) *To anyone new to the site: I've noticed it's always helpful to change the “SORT BY” just above reviews, to the option “NEW” on the game’s main page. I’ve noticed this is the option that has the most completed games reviewed. The SE portion of the game took me 3 hours & 45 minutes The CE bonus play took me, 1hr 22min Total gameplay 5 hr. 7min I actually used the stop watch on my cell phone whenever I was playing this. I try and do all the mini games but will skip them the second I’m annoyed. I do all the HOS without hints & with penalty. I play on “custom” mode. This game has EASY/HARD mode for all the mini games, which is a huge plus for me with Domini. I’m telling you how I play because it may be faster/slower for some. Aside from interior locations the entire game is played in moonlit areas, at night, with snow on the ground. I loved that you don't have to carry items all that long so you remember where they go. They are usually used in the same room or the one next to it. It’s great that it only takes a moment to look over the scene to see where an item should be placed, WITHOUT opening the secondary window. 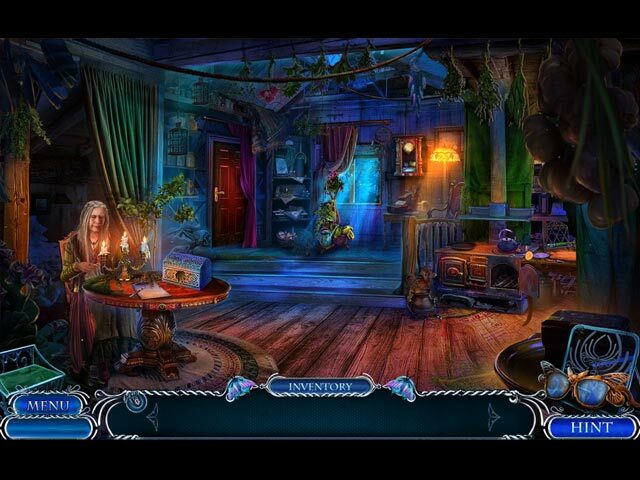 It has many different types of hidden object scenes to cater to all of us and they are not repeated. The special effects didn’t wash out the scene. The graphics are vibrant and you play in beautiful locations. When you open the task book area, there is also a notebook to check every now and then because it holds picked up notes to review the story. It’s a shame you can’t replay the cut scenes because they were worth re-watching. So far, my favorite games in this series is MT #4 Her own eyes (you collect really amusing death files) and MT #6 The Hangman (which is remarkable because of the interactive details in every scene, the entire game, (not just the demo) you need to click every item in the scene and watch beautiful renderings of ghosts pop up here and there). In this game, MT #7 The House of the Others, you only see these interactive details in the demo. Chapter 3 has one more… so be on the lookout for it. Though this isn’t my favorite game in this series, it is still a solid 5 star game with a remarkable CE bonus play. DEVICE SPECIAL TO THIS GAME: are the “glasses” that alter the visual in a location and show our main characters spin on what happened in a location that can’t be seen, and in the past. We used them first in MT #4, 5 & 6, and I liked using them equally here. I love the ability of the character we play in the MT that has the glasses. IF YOU LIKED THIS GAME TRY THESE: 1. Mystery Tales #4 Her own eyes, MT #5 Eye of the Fire, & MT #6 The Hangman. Gameplay is identical to this. 2. MT #3 The Alaskan Wild feels most like this game & is also played in winter at night with gorgeous borealis skies but it doesn't have the special glasses. 3. Whispered Secrets Everburning Candle For anyone that cares, I did a review specific to what’s in the CE version under that game's page; in case you’re on the fence as to which version to get it has more information on the bonus play and collectibles & what they do. Huge hugs to all of you at Big Fish, and Domini Games that created this great game!! I am one of your biggest fans. Rated 5 out of 5 by bwake47 from ANOTHER GOOD GAME!! I just finished the demo and was really enjoying the game. I like haunted house games. I like that there are a variety of ghosts and although I only played the demo, I think each ghost will have a different reason for being murdered. I know the theme of the story has been played before, but it is one that you can understand and relate to. I also like the fact that you don't carry a large inventory, but get to use an item quickly, or find it pretty quick. I hate having to try and remember what I needed an item for and can't because it was so far back in the game. This game also flowed and was easy to follow. At least in the demo. I usually leave reviews after playing the entire game, instead of the demo. But, I've gotten behind with my games and don't know how soon I will actually play the entire game. I do plan however, to purchase the game. Many reviewers complain about spooky games and want more fairy tale games. I personally prefer the scary, spooky games and would like less fairy tales. So, to each their own pleasure. Just don't complain when your favorite games aren't being released. Your turn will be next. :) Happy Gaming Everyone!! Rated 3 out of 5 by PATinPNS from It's Okay, but Enough Already This is posted after playing the complete game. Had it not been for the theme of this game, I would have probably had a different feeling about it. It is pretty much the same as most the games we have been getting. Ghosts, saving a relative, etc, etc, etc. This wasn't horrible, and I don't regret making the purchase, but they need to find some other ways of entertaining us. I think I was most disappointed in the voice overs. They were... dull to say the least. One could almost figure out what was going to be said before they opened their mouths. I'm not quite sure what I expected, but this wasn't it. The colors were the blues and purples that you come to expect from ghost stories. The graphics were well done with no complaints on that. Music and effects went along with the action in the scene. I did like the level of challenge. I actually completed most of the mini games which means they weren't that difficult. Some I could not figure out what to do until the computer showed me and I felt like an idiot, but hey, there are not do overs here. 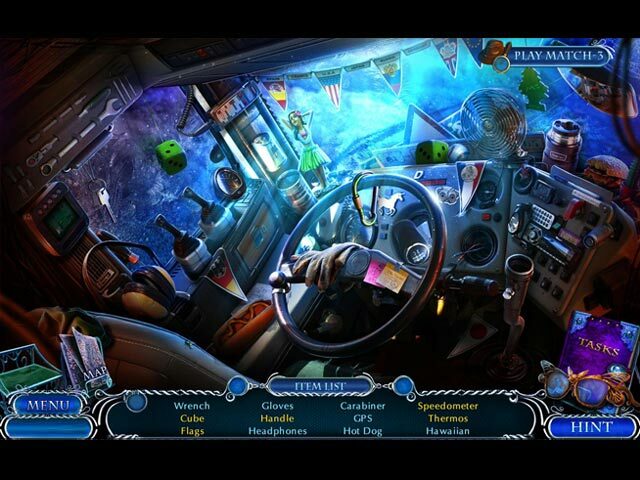 The hidden object scenes were well done, clear and varied which I like. The interactive map was useful, but I found that many areas were completed in the same scene. There is some back and forth, but not like usual. I do like that aspect very much. There are several levels of difficulty. I played on the custom so I could set the hint and skip buttons to recharge quickly. Others will go in depth about the story. I will just say, I, for one, and so tired of ghosts, witches and things that go bump in the night, I could scream. I just know there are developers out there who can do a good old fashion mystery story. This one followed that same routine of saving someone from the grips of a mad ghost. I honestly didn't follow the story as much as I normally do. I just played the game. Give the demo a try and maybe you'll like this more than I. As I said, this would have been a decent game to me if not for the theme. Rated 3 out of 5 by pennmom36 from ANOTHER GAME THAT GOES SOUTH AFTER THE DEMO I buy the Collector's Edition versions of these HOPA games, that have an interesting demo, and sometimes games in a series that have always been good even if the demo was less than stellar, during BOGO sales. It's funny that some of the less stellar games improve vastly after the demo, yet some of the more interesting game demos, fizzle and head south. I wait to finish playing the game until the Standard Edition version is released, and usually play the SE demo version first, and then finish playing the CE version (or at least try to finish) I really liked the demo, but I had no desire to keep playing this game in its entirety. I made it through Chapter 3, and almost all of chapter 4, but it just became stagnant, adding very little new factors to the story. Really the only meat of the story happens within the demo, all the rest are just bits and pieces that cinch the fact that good ole dad was just a[n] __________ (fill in the blank) I also think Mystery Tales should ditch the color scheme, the over abundance of blue and purple hues, make the game less credible, I keep expecting a Unicorn to walk across the screen, leaving a trail of glitter bombs behind him! Anyway, here's a recap of my review to help you decide which version, if any, is right for you: You see dead people. This is your gift, this is also your curse, and this time it's personal. You've been contacted by your brother Patrick, and this can only mean one thing, he's probably dead! Ghost hunting runs in the family, and Patrick was the host of the popular Ghost Riders show. His latest show took place in the Arden Manor, home to Count Valack Arden, an infamous serial killer. No one knows why this once kind and gentle father, turned into a vicious killer, but it's probably safe to assume it has something to do with the death of his baby girl Helen. No credible ghost chaser would be caught "dead" without their Astral Glasses that allow you to see past events as well as interact with the astral plane and it's objects. In the Collector's Edition version, there are 44 Hidden Butterflies (and apparently moths are included) that allow you to use them as currency to purchase 14 different Cursed Items. There are also 15 hidden Morphing Figurines, 16 collectible Tarot Cards and Collectible Notes, which always seem to blow away from your hands as soon as you arrive, happens every time! 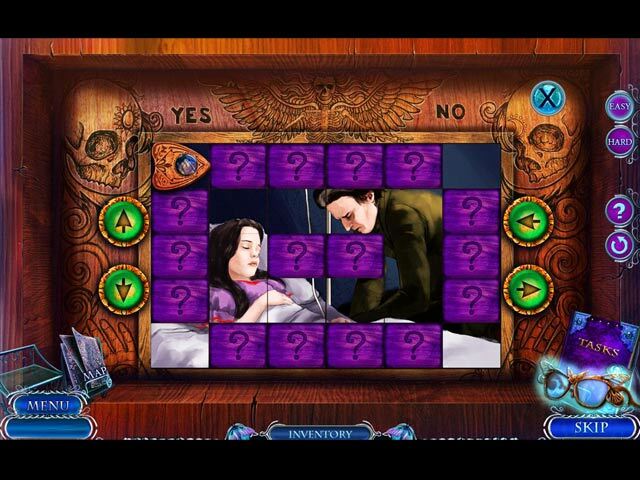 The Hidden Object Scenes are varied and for the most part, are entertaining, although they aren't very creative. In the CE version, you can also opt to play a Match 3 game alternate. There are Interactive List finds, Silhouetted Shape finds, Keyword finds, and even Zoom Zone finds. My favorite however, are the "Spot the Difference" scenes. The Mini Games are decent, but even on the "Hard" setting, they seem fairly easy to solve. I played almost to the end of chapter 4, and was able to complete all of the puzzles, in Hard Mode, on the first or second attempt. Below are brief descriptions of some of the games you'll encounter during the demo: 1) Rotate the circles to create the symbols shown around the border, rotating one circle may affect others. 2) Swap the black and white tokens, they can only move forward and can only jump opposite colors. 3) Clear all ghosts by moving to a space next to them. 4) Select arrows to mold the lockpick to fit the lock. 5) Click on 4 different colored light filtering options to scan for the ghost in each scene. 6) Use directional arrows to move the planchette and flip over all tiles to create an image. 7) Swap books to create an image on the book spines, wrong selections will cause the books to shuffle. 8) Pick the correct card that matches the description given in the crystal ball. 9) Color the painting according to the numbers, some colors require mixing paints that equal larger sums. 10) Arrange arrows on the board to create a path that will cross all symbols. MYSTERY TALES GAMES AVAILABLE: Title***Collector's Edition Release Date***Average Rating Alaskan Wild (August 24-15) 3.8 Eye of the Fire (September 29-16) 3.4 Her Own Eyes (February 18-16) 4.1 The Hangman Returns (January 26-17) 3.7 The House of Others (June 29-17) 3.8 The Lost Hope (January 25-14) 4.0 The Twilight World (January 29-15) 3.5 The Collector's Edition version has 15 Collectible Figurines, 16 Collectible Tarot Cards, Missing Dossier Notes to find, 15 Morphing Objects, 44 Hidden Butterflies to purchase Cursed Items, 11 Concept Art pictures, 13 Wallpapers, 5 Music Soundtracks, 18 replayable Hidden Object Scenes, 34 Achievements to earn, a built in Strategy Guide and a Bonus Chapter, enjoy! Rated 2 out of 5 by Granny_Gruff from Save Another Sibling Who's done Something Stupid! Your brother, Patrick, stole your special spirit viewing glasses and managed to get in trouble with them. He was investigating Count Valack Arden's house for his program on ghosts when he became the latest victim of the Count. Count Arden, a serial killer, apparently went off the deep end when his daughter, Helen, died of illness. (Helen is the only faintly believable character and she is a ghost!) Now Patrick is trapped in the house as a spirit and the serial killer is using his body. His fiance, Stephanie, is about to become the new "vessel" for the killer's daughter. Guess who gets to fix this mess? Good stuff: The usual game elements are present. Bad stuff: The artwork is garishly colored, the puzzles are sad, the HOPs are sadder, and the story and characters fit right into that mix. I hope you won't take my word for anything. Please try the demo for yourself. Finding all the bad stuff is part of the fun!